I can’t say I’m that familiar with the Super Mario Galaxy games. I remember watching a friend play the first one, and it looked pretty complicated, even toward the beginning when it was still kind of holding the player’s hand. Still, I approve of the idea. Back in the day, possibly even before Super Mario World, I figured a logical extension to the Mario franchise would be to send him into outer space. Of course, Mario did spend some time in space long before his adventures with Rosalina. 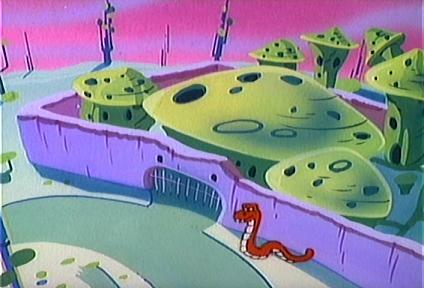 Two of the Super Mario Bros. Super Show cartoons took place there, and with no real indication as to how he got off-planet. 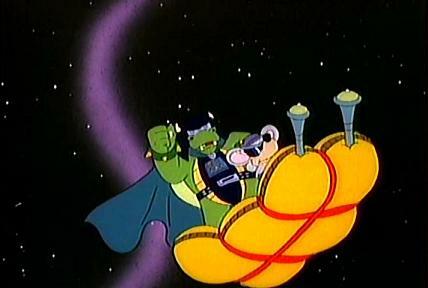 “Stars in Their Eyes” had the usual crew of Mario, Luigi, Toad, and the Princess traveling in a spaceship that looks to have been inspired by the Beatles’ yellow submarine, which has cannons that can fire spaghetti and meatballs. They crash-land on the planet Quirk, where Bowser, in the guise of Moon Man Koopa and with help from Astro-Mouser, has enslaved the inhabitants. The design of the Quirks seems familiar, but I don’t know if it’s referencing anything in particular. 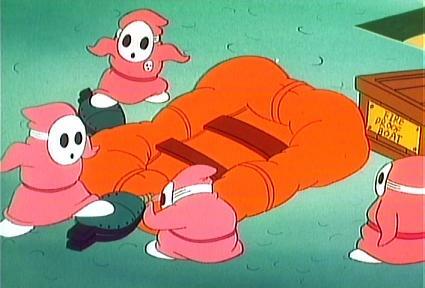 The Super Mario Wiki compares them to aliens from Star Trek: The Next Generation, but doesn’t specify which ones. Our heroes learn that Bowser’s technology is vulnerable to sound, and the Quirks later damage his ship, which has a weird bird-like appearance, by humming the Legend of Zelda theme. 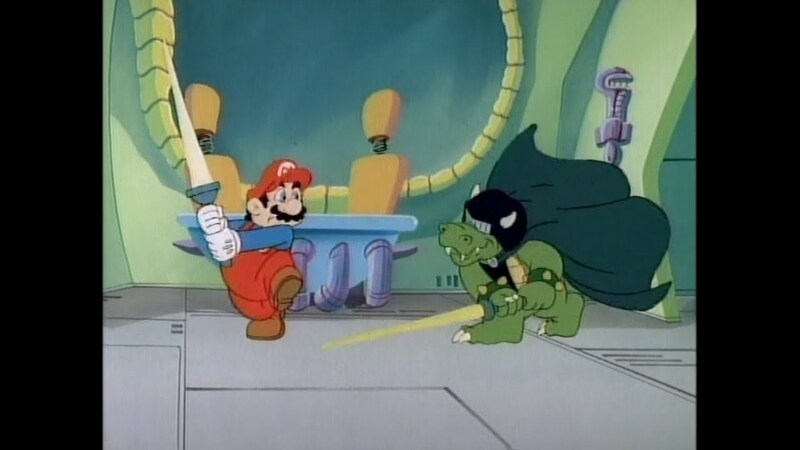 The other relevant cartoon, “Star Koopa,” is a Star Wars parody. Oddly, there was never a full Star Trek spoof, even though Mario’s opening Plumber’s Log narration at the beginning of each episode was obviously a Trek reference. I’d say it was because Mario wore a red shirt, but he actually still had a blue one at that point. Anyway, Bowser was Darth Koopa, the characters fought with light plungers, and a character named Obi-Wan Toadi had the catchphrase, “May the pasta be with you.” I wonder how long it took the writers to come up with those. More interesting to general Mario lore is that a desert planet was apparently colonized by settlers from the Mushroom Kingdom, hinting at an active space program. A Pokey and Cobrat are also seen on this planet, but whether they’re native or imported from the Mushroom World, we don’t know. Darth Koopa’s space station, the Koop Star, is equipped with a Birdo Ray that he can use to destroy planets with egg missiles. The Koop Star is shaped like an enormous faucet, Mario and company’s is the saucer-like Flying Pizza, and Darth Koopa and Mouser escape the wreckage of the Koop Star on an inflatable rubber raft. They did much the same joke in “Too Hot to Handle,” with its fireproof lava boat. I believe the first Mario game to feature a bona fide extraterrestrial is Super Mario Land, with its villain Tatanga. 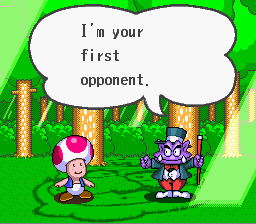 He reappears in the second game in this series, which also lets us know that it was Wario who hired him in the first place. And I recently learned that, in Wario’s Woods, there’s another character who looks a lot like Tatanga. This is the rather more dapper Katsini, who is apparently a rather gracious opponent for Toad. Perhaps the implication is that Wario has formed some sort of alliance with Tatanga’s species in general. 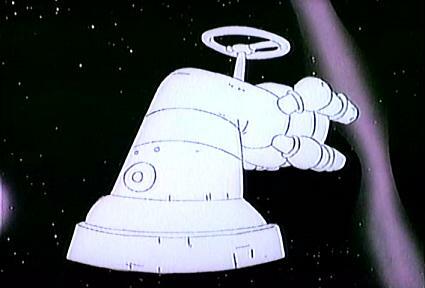 SML2 also had an area called the Space Zone, accessed by means of a giant hippo statue that blows soap bubbles. The place has reduced gravity, an idea that would be reused in the Galaxy games. The first stage there is a smiling moon that turns angry when hit by a star. Whether this is THE Moon for the Mushroom World isn’t entirely clear. Regardless, Mario visits the Moon again, or possibly a different moon, in Paper Mario: The Thousand-Year Door. Here, he reaches it by means of a cannon, and finds the X-Nauts’ fortress there. The X-Nauts are alien beings whose faces are always covered, so we don’t actually know what they look like. I understand Goombella references a Goomba having landed on the Moon “back in ’69,” again suggesting a functional space program. 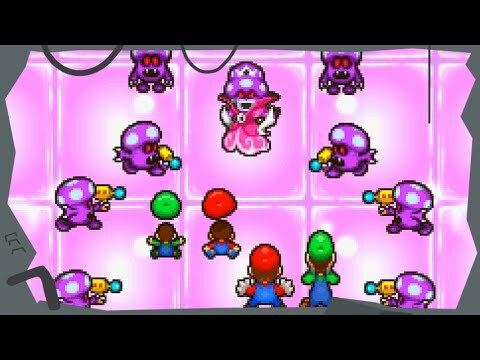 There’s another alien invasion in Mario & Luigi: Partners in Time, this time by the Shroobs, vicious and technologically advanced beings from a dying world who arrive in spaceships to take over the Mushroom Kingdom. They use the captured life force of Toads to power their ships, and turn out to be weak against baby tears. We also learn in Bowser’s Inside Story that King Koopa has kept some Shroobs frozen in his castle. 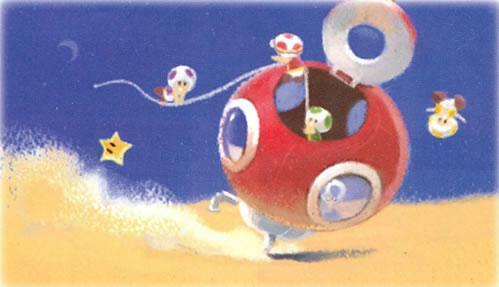 The Shroobs resemble mushrooms, as does their planet, suggesting a link to Toads and Goombas. 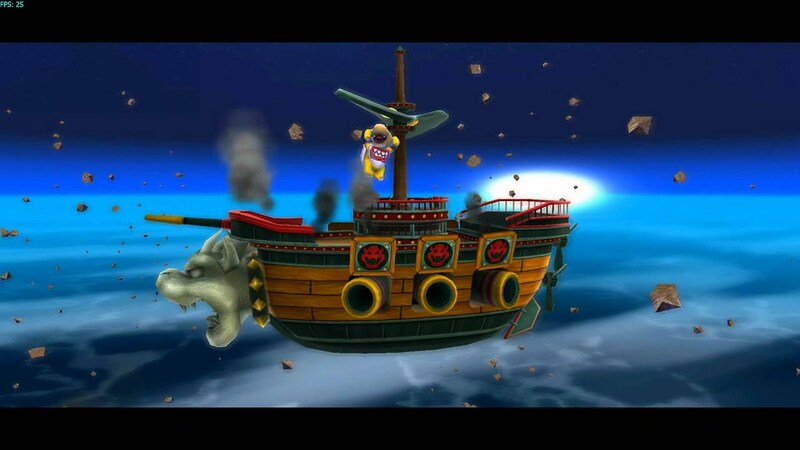 In the Galaxy games, the Koopas’ airships work in space, although I couldn’t say how. SMG has Mario reach different worlds by means of Rosalina’s Comet Observatory, but in SMG2 he receives his own ship. 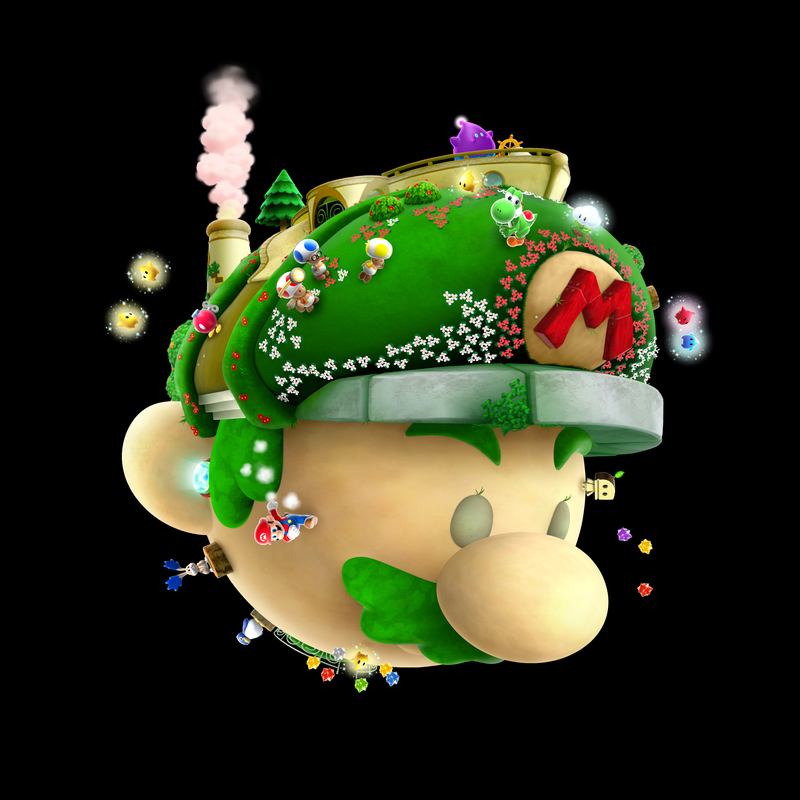 Originally belonging to a Luma named Lubba, he uses a Power Star to remodel it into a giant likeness of Mario’s head. I suppose it wasn’t Mario’s idea, but I have to suspect that he really got a reputation as an egomaniac around the universe. 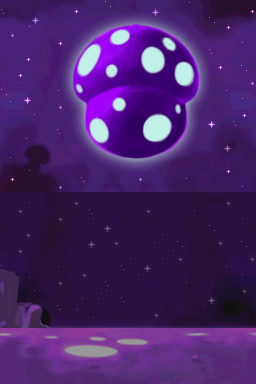 The Lumas also help to build a ship for the Toad Brigade, known as the Starshroom. The Galaxy games feature a lot of enemies common to the Mario series, which raises some questions. Did Goombas, Bloopers, Wigglers, and Piranha Plants evolve independently on different worlds, or spread out throughout them over time? 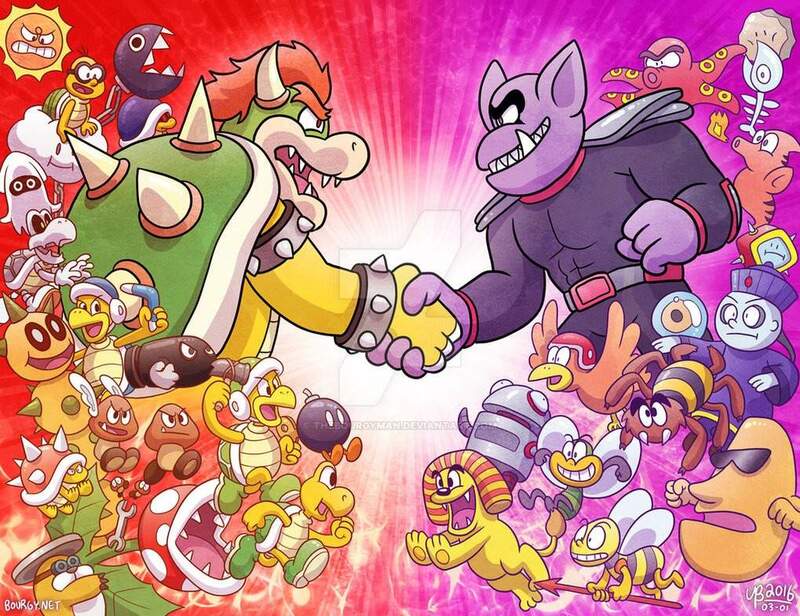 Or did Bowser just bring them to these other galaxies with him? And what about the varieties of these enemies that are only found in space, like Octoombas and Dino Piranhas? I guess it’s kind of ridiculous to dwell on this considering how many space-based franchises make most of the aliens either humanoid or quite similar to other Earth-bound life forms. I’d sort of like to see something that ties all this space stuff together. Granted, that doesn’t make a whole lot of sense considering that we’re dealing with the whole universe, but it still seems like there are some missed opportunities here. Maybe have the remaining Shroobs invade Tatanga’s world? For that matter, Kirby and Pit have both encountered Metroids, but Mario still hasn’t? And what about the planet Platean from DK: Jungle Climber? This entry was posted in Cartoons, Donkey Kong, Kid Icarus, Kirby, Mario, Metroid, Star Wars, Super Mario Bros. Super Show, Television, Video Games and tagged birdo ray, comet observatory, dk jungle climber, fireproof lava boat, flying pizza, goombas, katsini, king bowser koopa, koop star, luigi mario, mario and luigi: bowser's inside story, mario and luigi: partners in time, moon, mouser, octoombas, paper mario: the thousand-year door, platean, princess peach toadstool, Rosalina, shroobs, space zone, starship mario, starshroom, super mario galaxy, super mario galaxy 2, super mario land, super mario land 2, tatanga, toad, toad brigade, toads, wario, wario's woods, x-nauts. Bookmark the permalink.